Since our four architectural practices came together to publish the first Superdensity report in 2007 (Recommendations for Living at Superdensity) many of its recommendations have become accepted best practice. However, the intensity of development in London continues to increase, in some cases way beyond the densities envisaged in our earlier study, and as such we feel it is time to both restate those principles and air emerging concerns. The proliferation of tall towers is one controversial aspect of this trend, but not the only one. We are concerned about the immediate social and environmental impacts of very dense developments and their long-term sustainability. We also observe that this new superdensity – which we’ve dubbed hyperdensity when it’s over 350 homes or dwellings per hectare - derives, not from London’s distinctive and popular urban forms, but from global development patterns. We may well ask, is London becoming a victim of its own success, meeting demand by sacrificing the very distinctiveness which makes people want to live and work here? Though the rash of tall towers is a concern, this report is not another campaign against those per se – that genie is out of the bottle. Rather, it gives positive guidance on how to combine ambitious densities with popular and familiar urban forms. Building on our first report, through a series of essays and case studies, we show that it is possible to create successful places based around streets and a variety of urban typologies, including houses and medium-rise apartment blocks, as well as some carefully integrated taller buildings. We show that densities up to around 350 homes per hectare can be achieved in this way (corresponding to the top of the London Plan Density Matrix at 1,100 habitable rooms per hectare for central well-connected sites). Above that, we believe there should be a presumption against development, and that any exceptions should be subject to much more rigorous impact testing. The pace and extent of change to London’s physical fabric is greater today than at any time since the era of post-war reconstruction. In 1981 London’s population was 6.8 million – today it is 8.3 million and predicted to reach 10 million by 2031. London’s success in attracting people and money creates a tremendous challenge for the provision of additional homes and infrastructure and inevitable pressure to increase development densities. It is against this background that our group of four architectural practices, specialising in housing and neighbourhood planning, is publishing further guidance and observations about how to create more and better homes for Londoners. The practices have been at the forefront of housing debate, design and delivery for 40 years or more, and are currently delivering a significant proportion of London’s supply of new homes. We are therefore able to take a long view, and to bring experience from across the whole spectrum of housing by type, location and tenure. We are creating homes for all sorts of people: young and old, wealthy and poor, singles and families. 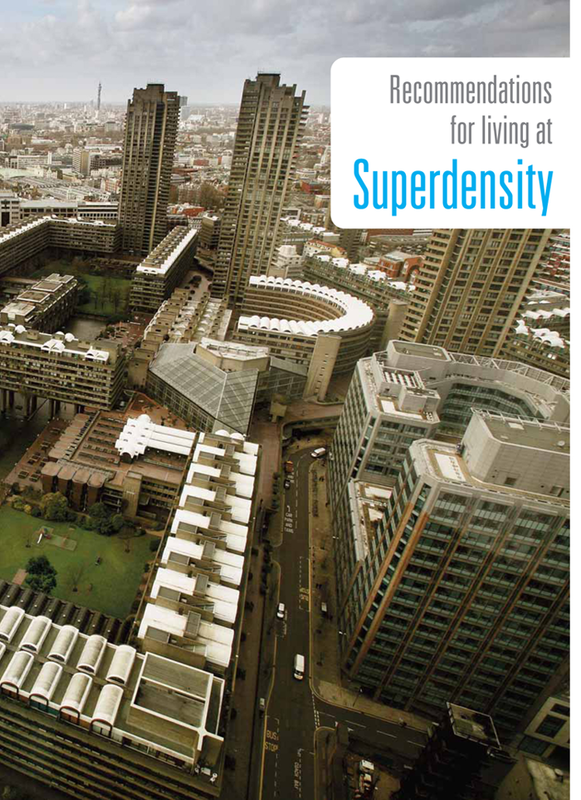 In 2007, Recommendations for Living at Superdensity was published by Design for Homes with support from the NHBC and Design for London. This intervention was triggered by a shared concern that the density of residential development was increasing rapidly, but without a widespread understanding of how to create high density developments which would be successful in the long term – and how to avoid repeating past mistakes. We defined the threshold for superdensity as 150 homes per hectare (around 450-500 habitable rooms) or above. These figures are reflected both in past planning policies for central London and in the current London Plan. Planning authorities have started to approve residential developments far denser than those we considered in 2007 – we refer to these as ‘hyperdensity’. For example, Wood Wharf, next to Canary Wharf, will contain around 3,100 apartments at a density of 436 homes per hectare. It features a cluster of tall residential towers peaking at 57 storeys. Smaller developments, with more tightly drawn site boundaries, can work out at over 1,000 homes per hectare – more than double the maximum envisaged by the London Plan matrix. We provide in the Appendix a summary of the recommendations in the Superdensity report. The issues identified then are even more relevant today, and it is striking to note that the predicted need for additional homes in London has increased since then from 31,000 a year to 49,000. Superdensity set out a series of recommendations under 10 headings. Seven of these were about design, and we were pleased to see most of our suggestions taken up in the Mayor’s London Housing Design Guide and subsequently in SPG 12 of the London Plan. Although we don’t agree with everything in SPG 12 we acknowledge that it is succeeding in raising the quality of housing and in harmonising standards across the capital. (Our reservations are that some aspects of design which we regard as good practice in most situations have been elevated to the status of strict rules in all situations – this is leading to a certain rigidity and homogeneity of design solutions.) It is time for a review of the impact of the guidance, and potential adjustment to some its provisions. This will now be happening in the context of the National Housing Standards Review. The other three sections in Superdensity (chapters 4, 9 and 10) were about the related topics of management, procurement and cost-in-use. Although these continue to be widely debated within the housing industry they hardly feature in the London Plan, and there is not the same clear consensus about good practice or any of the same impetus to implement them in practice. (More recently the Mayor’s Private Rental Management Regime is a welcome attempt to establish common standards in that sector.) As the density of new development continues to rise, its long term sustainability becomes increasingly dependent on effective structures of ownership, management and funding of services. 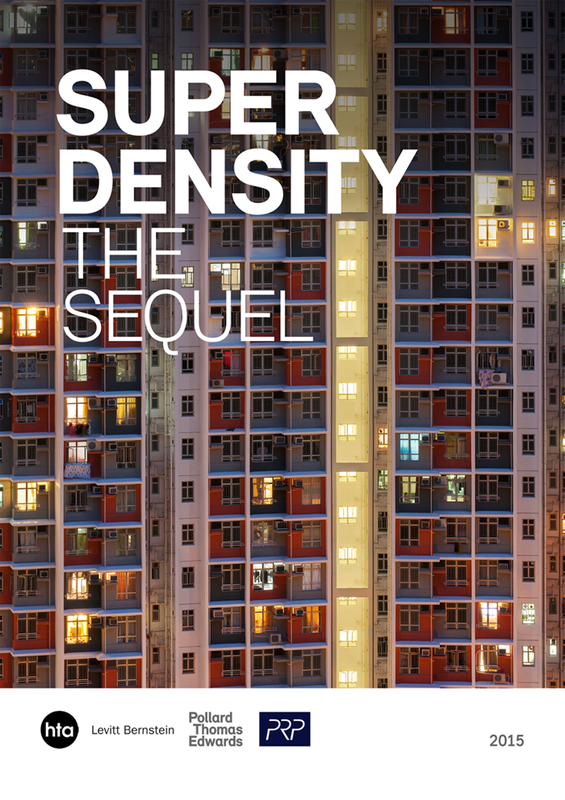 This new report, Superdensity: the Sequel, consists of a series of short essays and case studies which show how patterns of development in London have evolved since the first report was published and offers some ideas about the way forward. It does not revisit the design guidance in the original, which we think still holds good and is now widely accepted and practised. The new report does not try to be comprehensive. For example, it does not deal with the hugely important subjects of utilities, transport and community infrastructure. Rather, it aims to provide some fresh perspectives on how to create successful homes and places at high densities up to around 350 homes per hectare. Although London is the focus of this report, the observations are relevant to other UK cities, and hopefully will become increasingly applicable as and when economic growth starts to exert development pressure more evenly across the country. The first essay is called How Dense Can We Be? It shows just how far and how fast things have changed since our previous report. It concludes that there are many ways of creating more and better homes in London on previously developed land and at moderate height – before we resort to high-rise or Green Belt release. The public debate about housing supply and design has tended to polarise between those who think towers are the solution and those who believe that London should be allowed to spread outwards. We believe that both solutions have some part to play, but neither is the only answer or the best answer. Our case studies show that there is lots of scope to create high density places within existing neighbourhoods and with a creative mix of typologies and building heights. The second essay is called Street Life at Superdensity. It expands on the importance of thinking about our streets and public places as the setting for civic life and for the (mostly) private structures which should form the background to public space. It emphasises the primacy of the spaces-in-between and the limitations of the ‘object building’. In this context, the question is not whether high-rise is appropriate to London, but how and where to combine different urban forms in relation to our street network. The third essay is called Creating Mixed Communities at Superdensity. The integration of market housing with subsidised housing is enshrined in policy and good practice and is one of the things which makes London distinctive and different among world cities. It is relatively easy to create mixed neighbourhoods at low and medium densities, and the traditional London street house and mansion block are proven models of how to do it. However, it becomes progressively harder to do as densities rise, building heights increase and the spaces in between are squeezed. This piece looks at how good design can facilitate the integration of diverse households and can accommodate different tenures, levels of wealth, cultures and household size. It also considers whether integration is actually practicable and sustainable in high-rise development. The final essay, Managing Superdensity, comes back to the growing importance of management strategies in sustaining successful places and the related issue of service charges. Denser (and especially taller) development requires more management and therefore more cost to be passed on to the occupier. How can we design and manage high density developments to keep cost-in-use under control? What are the implications of rising costs for residents on lower incomes – and is there any justification for ‘poor doors’? We conclude with some case studies showing recent and current projects which address all of the issues above. The projects are in London and the South East and involve neighbourhood-scale interventions combining mixed-tenure homes, public space and other community infrastructure. All achieve densities of between 150 and 350 homes per hectare, using mostly mid-rise typologies, combined with elements of low-rise housing and some carefully located taller buildings. As they demonstrate there are many alternative ways to create more and better homes in London before we resort to building more super-towers or concreting over our open spaces. Chapter 1 How dense can we be?